It remains unclear exactly which river sparked the creativity of Florida’s Ancient River (also unclear: what passes for ancient in the land of Epcot Center?). Perhaps it’s metaphorical, perhaps it’s allegorical, perhaps it just doesn’t matter. The fact is that three young men from Florida have taken up the magical tools of their forefathers – guitar, bass and drums – and like so many river-watchers before them, have seen the tools converge into something greater than the sum of its parts. It may be that this Ancient River carries one of the core messages on the Austin Psych Fest as a whole: that the psychedelic experience (musically speaking, for the moment) is at once incredibly personal and yet, incredible relate-able, incredibly shareable. 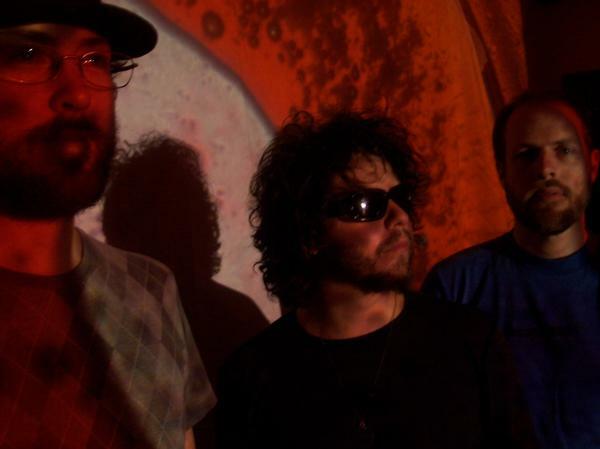 Band members J. Barreto (guitar and vocals), Zach Veltheim (bass) and Chad Voight (drums) took part in that sharing in advance of their Austin Psych Fest performance. Can you tell us a little bit about how Ancient River came together as a band? Does your friendship extend past the history of the band? How have your own relationships about music changed since forming the band? Zach: We came together through mutual friends. We were friends that started playing together out of our mutual love and respect for music. I think our relationships with music have grown since coming together. I’m constantly inspired and delighted with what happens when we play together. Are you from Florida originally? My perception of strange/interesting/weird/avant-garde music from Florida pretty much begins with death metal and ends with some booty-bass albums. What am I missing in regard to what’s going on in Florida currently? Gun to your head, who is your favorite Florida band of all time (Ancient River excluded)? Zach: We all grew up in Florida. It’s a weird melting pot state. From the great Harry Stone soul of Miami or the jazz magnificence of Nat and Cannonball Adderly to the rock greatness of Gram Parsons and Tom Petty, there is much to celebrate. But if I had to pick one, I guess it would be N Sync. One song I’m particularly fascinated by is the number, “Eye to I.” There’s almost a casualness about the way the song unfolds, beautiful as it is, in almost a “Little Wing”-like fashion. Then comes the chorus (“I just don’t know what you want”) that just explodes on the listener – very catchy and very cool. What can you tell us about this song, and what it means to you? Could it have even been subconsciously influenced by the Bad Brains “I and I Survive” or “I Against I”? J.: Yeah, Hendrix and Neil Young always come up in our sound. The song basically works well on our EP “Under the Sun”, which has a lot to do with mankind and human nature. The lyrics kind of focus on those themes on a primitive level. Seeing another face to face and all that comes with that kind of experience. From where does the name of the band originate? If you haven’t done so already, may I suggest you guys try to play a show with the band Ancient Sky? Seriously – I think the two bands would complement each other very well. J: We wanted something all-encompassing and dreamy. “Ancient River” came out of a line on Neil Young’s song “Thrasher”. Don’t know too much about current bands, there are so many, but we would be happy to play with anyone. What music have you been listening to lately? Can you think of any band or album that you didn’t really appreciate, perhaps, five years ago, but now really love? Chad: Right now I am listening to Frank Zappa with double drummers Terry Bozzio and Chad Wackerman. Five years ago, not really. Ram Dass said this: “It is important to expect nothing, to take every experience, including the negative ones, as merely steps on the path, and to proceed.” Agree or disagree? How, if at all, does the quote above relate to the path of Ancient River as a band? What setbacks have you faced thus far? What encourages you to continue creating music? Chad: I think we have had some expectations as a band. When a band works hard to practice a live set and write songs there is a level of positive response that is hoped for and its always good to hear positive feedback. We’re encouraged everyday by the spirit of music that lives in each of us. How did you originally become aware of the Austin Psych Fest? How did it happen that you are making to trip from Florida for the show? Are there any bands in particular that you are looking forward to seeing? Chad: We first heard about Psych Fest about a year ago and thought it was a great thing going on. We dig Austin and its contribution to music. We want to be one among a group of bands at a festival that share a similar musical vision. We are looking forward to seeing all the bands at Psych Fest. Will you cover “River Deep, Mountain High” and if so, will you indeed be high? Zach: I would probably choose a different Spector-Barry-Greenwich (RIP) song. Maybe “Be My Baby” or “I Can Hear Music.” If we did cover “River Deep, Mountain High”, however, we would probably be high … and deep. What’s next from Ancient River? J: We have 3 releases coming out before summer’s end.